In its September 2012 issue, Allure magazine interviewed Tom Bachik, a Los Angeles-based manicurist who works with celebrities like Beyoncé and Victoria Beckham. 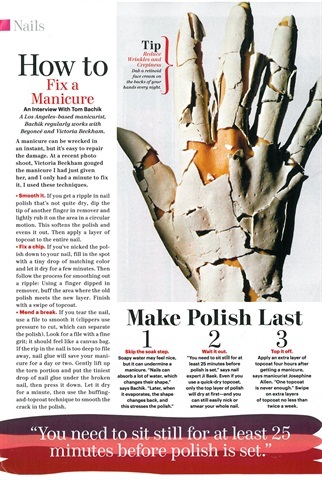 He shared with readers a few of his tips on fixing wrecked manicures. Smooth it: If you get a ripple in nail polish that's not quite dry, dip the tip of another finger in remover and lightly rub it on the area in a circular motion. This softens the polish and evens it out. Then apply a layer of topcoat to the entire nail. Fix a chip: If the polish is nicked down to the nail, fill in the spot with a tiny drop of matching color and let it dry for a few minutes. Then follow the process for smoothing out a ripple. Mend a break: If the nail is torn, use a file to smooth it. Look for a file with a fine grit. If the rip in the nail is too deep to file away, nail glue will save your manicure for a day or two. Gently lift up the torn portion and put a small drop of nail glue under the broken nail. Then press it down. Let it dry for a minute before using the buffing and topcoat technique to smooth the crack. Bachik also shared a few tips on how to make polish last longer than an average manicure. Skip the soak step. Nails tend to absorb a lot of water, which changes their shape and stresses the polish. Wait at least 25 minutes for nails to dry before engaging in other activities. Apply an extra layer of topcoat four hours after the manicure.